-Last year was an abysmal one for tennis. It began with the match-fixing controversy that erupted just as the Australian Open was getting underway, continued with Maria Sharapova’s drug suspension, and ended with Roger Federer and Rafael Nadal both cutting their seasons short because of injuries. What a difference a turn of the calendar makes. This year began with the throwback finals in Melbourne—(pregnant) Serena versus Venus and Roger versus Rafa—continued with Federer and Nadal reclaiming their Wimbledon and French Open crowns, and wrapped up with four American women reaching the semifinals at the US Open and Sloane Stephens capping an astonishing comeback by winning the year’s last major. Good karma begets good karma; even with five of the top 11 players sidelined with injuries and a very top heavy (or was it bottom light?) draw, the men’s side at the US Open, although ultimately overshadowed by the women’s, offered plenty of entertainment. Usually, the end of the Open leaves me with an empty feeling—summer is over, the heart of the tennis season is over, and Melbourne seems awfully far away. But not this time: the 2017 season has left me so jazzed that I seem to have completely dodged that post-Open, post-summer funk, and the 120 days between now and the start of the Australian doesn’t seem very long at all. Anyway, what a turnaround year for tennis. 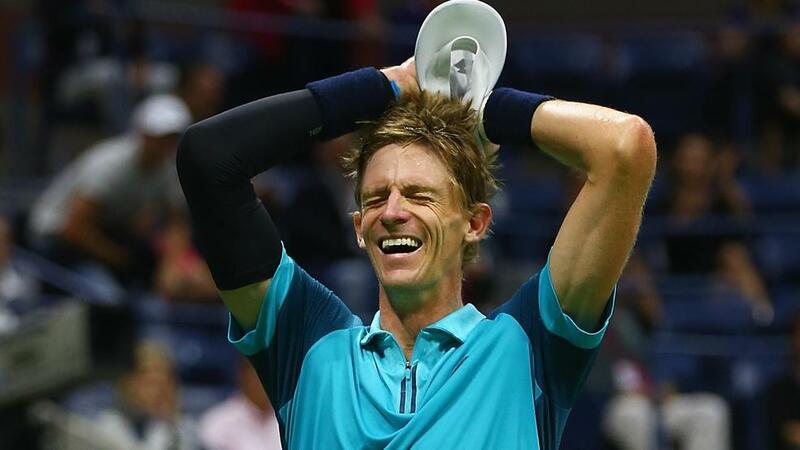 -For purely personal reasons, it was gratifying to see Kevin Anderson reach the finals of the Open. In July, I went to Delray Beach, Florida on a magazine assignment. I was in town for a junior tournament that was being held at the Delray Beach Tennis Center. On my first day there, I noticed that Anderson, who lives in the area, was practicing on the stadium court. This was barely a week after he had lost to Sam Querrey in a fourth-round match at Wimbledon. Come midsummer, daytime temperatures in south Florida hover around 90 degrees and the humidity clocks in at about 9000 percent. Anderson was on court for well over two hours, and it was as grueling a training session as I’ve ever witnessed. I returned to the tennis center the next day, and there he was on the stadium court again, perilously close to dissolving into a puddle of sweat. A couple of days later, I went to the tennis center to have a hit with my 12-year-old daughter, who had been training for a few weeks at a nearby tennis academy. Sure enough, Anderson was on the stadium court, practicing with a local kid who played for the Florida State men’s varsity team. Ava and I watched for a few minutes, and then chatted briefly with Anderson when he took a break (it’s true what they say: he is a mensch). What began as a chance encounter with Anderson morphed, two months later, into a life lesson. Ava is fairly ambitious as tennis goes, and among the various sports-related clichés that get tossed around in our sports-mad house is the one about luck happening when preparation meets opportunity. In reaching the final, Anderson provided Ava with a real-time demonstration of this truth. Yes, he was in the friendlier half of the men’s draw, and yes, he was spared a rematch with Sascha Zverev, who had beaten him twice in the run-up to the Open. But without all the preparation that he had done in Delray Beach, it is unlikely Anderson would have been able to capitalize on the opportunity that suddenly presented itself in New York. It was a textbook example of creating your own luck and, as such, an invaluable lesson for Ava. She adores Rafa, but she was pulling for Anderson last Sunday. -The Open is a great event, but too often the night matches detract from its greatness. Matches that run past midnight are a disservice to the fans and players and ultimately hurt the tournament. Just look at what happened to Sascha Zverev this year. His first-round match didn’t finish until 2:05am. Less than 48 hours later, he lost to Borna Coric in the second round. Maybe he would have lost anyway, and Coric certainly played a superb match. But Zverev’s sluggishness suggested that he was still feeling the effects of the all-nighter he’d pulled (he surely hadn’t gone to bed much before 5am after his first-round match), and that might well have been the decisive factor. Zverev’s early exit deprived the tournament of its most hyped young star and further hollowed out the bottom half of the men’s draw. The late-night matches are almost a point of pride for the Open, part of tournament lore. The thinking seems to be that they buttress the Open’s claim to being the “world’s toughest tennis” and reinforce the New York-ness of the event—you know, the whole city-that-never-sleeps thing. But the players dread these matches, and judging by the thousands of empty seats that blight my television screen whenever a match extends into the early hours of the morning, most fans aren’t big on them, either. My solution would be to ditch the two-sessions-per-day approach; just make the whole day a single session, covering afternoon and evening matches. Emptying and then refilling Ashe Stadium eats up a precious hour and is often the reason the night matches run past midnight. If play on Ashe were continuous, the marquee night matches would still get on court during primetime, and they might actually end during primetime, too. To make up for the lost revenue and ensure that seats remain filled after dark, the USTA could follow the lead of the French Open and sell discounted evening passes, which allow people onto the grounds after 5:30 pm and into Court Philippe Chatrier on a space-available basis. Tennis is not meant to be played after midnight—not sober, anyway, and definitely not with a major title on the line—and the Open really ought to do what it can to get the evening matches wrapped up at a reasonable hour.